Navy, waterproof jacket from Columbia. Crafted using Columbia’s Omni-Tech™ technology, the ‘Mia Monte II’ jacket is waterproof, breathable and fully seam sealed. Lined using Omni-Heat™ thermal reflective lining and insulation, for warmth, comfort and dryness in winter weather conditions. The jacket comprises a concealed, waterproof zip through fastening, an adjustable and detachable hood with a high collar for protection against the elements and long sleeves with adjustable Velcro cuffs. 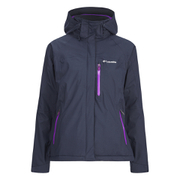 Featuring underarm venting, three contrasting, waterproof zip pockets and an adjustable hem. The coat is complete with signature Columbia branding embroidered to the chest and Omni-Tech™ to the sleeve. Outer: 100% Nylon. Lining: 100% Polyester.